$0.99 (regularly $2.99) 3/25/2016 - 4/8/2016! The first half of the twenty-first century will be the most globally competitive in history. Will your children be prepared? 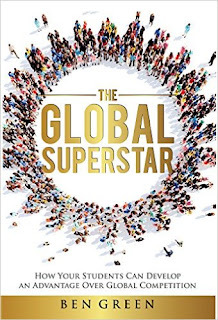 Discover what skills they’ll need and how to develop them in The Global Superstar. Mediocrity won’t cut it anymore. The global marketplace is putting an increasing demand on workers to be better prepared for employment. Meanwhile, there are fewer jobs, including jobs with lesser skill sets. Earning a living wage requires getting an edge on the competition—and that edge is becoming a global learner and preparing for the likely jobs of the future. Author Ben Green serves as your guide to what jobs will be popular and what skills are needed. He explains why a shift in education is needed and offers resources for parents, teachers, and future job seekers to find more information. Green’s how-to manual is dedicated to preparing students for the increasingly competitive global marketplace. With this book, you will understand the characteristics, educational requirements, and experience necessary to compete with job seekers from around the world. So what are you waiting for? It’s time to prepare your children to become the global superstars.